The aspirants can apply for courses in online mode only. The date for online application is open from 21st March 2019 to 18th April 2019. 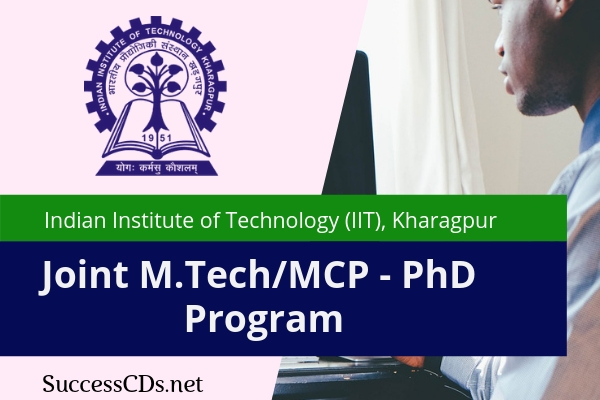 This Program encourages bright and motivated students to enrol themselves for PhD after completion of first year of M. Tech/MCP Program. All the GATE qualified candidates, who will apply for JMP 2019 should also register themselves for Common Offer Acceptance Portal (COAP). Only for those disciplines where there is no relevant GATE paper, XE/XL paper of the GATE exam is applicable. NET qualified applicants are also eligible for admission to MCP. Skills in basic science, engineering, and relevant areas. Fee payment has to be made online only and all the necessary qualifying certificates and documents have to be uploaded online at the time of submitting the application.